MySQL includes two timestamp data types that explicitly include a numbered month–date (YYYY-MM-DD) and datetime (YYYY-MM-DD hh:mm:ss). As such, I want to make sure my conversion accommodates both data types. 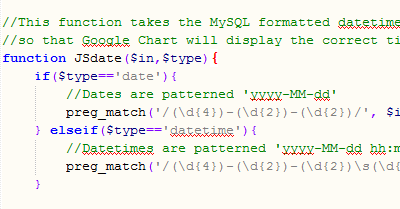 Worth mentioning is that although dates and datetimes are rigid data types within the database, once they’ve been queried and manipulated by PHP, they are plain old strings. For this reason, it makes sense to use regular expressions (regex) to extract the individual components of these strings. I should point out this post on StackOverflow that saved me time in figuring out the proper regex. Understanding this approach is 9/10 of the battle. Once the month-integer has been extracted from the date-string, a 1 is subtracted from its value and the date string can be built back up into any format. In this case, I rebuild the string to the format expected by a Google Chart. Using the above function requires two inputs; the MySQL-formatted date/datetime string and whether the string is to be returned as a date, or a datetime.